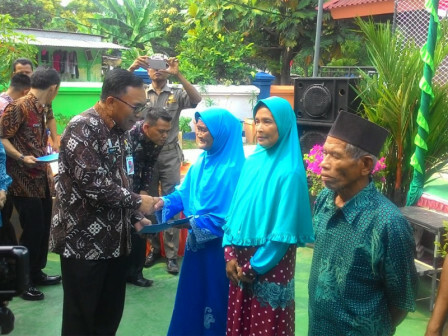 Free medical treatment and glasses are provided to hundreds of Seribu Islands in the activities of Family Planning Health National Army (TNI) Manunggal held at Tidung Ceria RPTRA, Tidung Island.
" Herein we have general treatment is for 350 people and glasses distribution is for 400 people, family planning, injections, pills, spirals and implants"
Seribu Islands Empowerment, Child Protection and Population Control Sub-dept. Head, Poltak Munthe disclosed that it has been held since May and will end in October 2018. Yesterday was the peak of activities and there were several family planning services, activity groups’ formation (Poktan), general treatment, eye check-up and glasses distribution. "Herein we have general treatment is for 350 people and glasses distribution is for 400 people, family planning, injections, pills, spirals and implants," he expressed, Thursday (8/9). This free service gets an appreciation from Seribu Islands Regent, Husein Murad. It is held regularly every year and is the result of collaboration between the local government and the TNI. "Thank you to all those who have supported this activity until October," he said.